The following article is translated from a supplement to Revolución Permanente, newspaper of the Grupo Internacionalista, Mexican section of the League for the Fourth International. JUNE 20 – Mexico has just had its Bloody Sunday. In Russia, the police attack on a march of workers who only wanted to present a petition to the Tsar sparked the 1905 Revolution. In Mexico of 2016, the massacre of Sunday, June 19 in Nochixtlán, Oaxaca against teachers, students, social activists and parents could be the detonator for an explosion of class struggle around the country. The protesters are fighting against the disastrous “educational reform” which seeks to destroy independent teacher unionism. For five days they defended a barricade on the superhighway to Mexico City, managing to stop a caravan of the Federal Police. Yesterday, the federales took their revenge. But instead of frightening people, it had the opposite effect. By the current count, according to spokesmen for the National Coordinating Committee of Education Workers (CNTE), the toll of that fateful Sunday the 19th in Nochixtlán is eight dead, 22 disappeared and 94 injured, 45 of them by bullets. The Federal Police, who at first denied using firearms, finally had to admit, in the face of photos and videos showing cops firing with abandon, that it was the uniformed police who shot the activists. Even so, the hail of bullets and gas did not intimidate the strikers and their supporters. After passing through the barricades at Nochixtlán, the police came across ferocious resistance from barricades in Huitzo, and then at the intersection of Hacienda Blanca. And once the convoy of buses and pick-up trucks of the Federal Police passed, the barricades were rebuilt. The effect of the repression has been to further exacerbate the anger of the population. 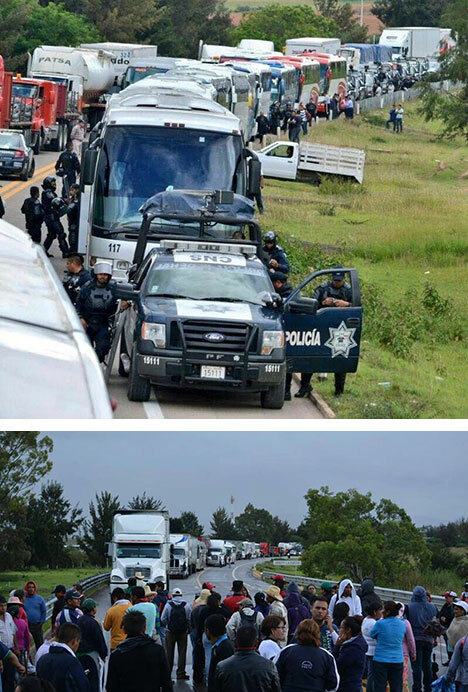 Hearing reports of a caravan of 4,000 gendarmes (riot troops) of the Federal Police being dispatched to Oaxaca to repress the teachers, strikers, parents and residents of Nochixtlán, Oaxaca as well as social activists from throughout the Mixteca set up a blockade of over 1,000 people on the superhighway, holding off the police convoy for five days (above), until it was dissolved in the massacre of Sunday, June 19. Today tens of thousands filled the streets from sidewalk to sidewalk in the city of Oaxaca to express their solidarity with the teachers, chanting slogans condemning the “murderers” and the “repressive government.” “Not with bullets, not with machine guns will the people be silenced,” they shouted. The mobilization recalled the atmosphere of the third mega-march of 16 June 2006 when the teachers swept away the police of hated Oaxaca governor Ulises Ruiz Ortiz after his failed attempt to evict the teachers’ encampment. But the popular rage will go nowhere without a revolutionary leadership that takes on the fundamental enemy, capitalism, and extends the strike to key sectors of the Mexican proletariat. It is essential that the mobilization have an internationalist class character, not nationalist such as bourgeois sectors are trying to foist on the movement, in particular those around the National Regeneration Movement (MORENA) of Andrés Manuel López Obrador, popularly known by his initials, AMLO, who was formerly a leading politician of the long-governing PRI (Institutional Revolutionary Party) and then the PRD (Party of the Democratic Revolution). The strike by the independent teachers unions is in a critical phase after the brutal attack by the bourgeois state. 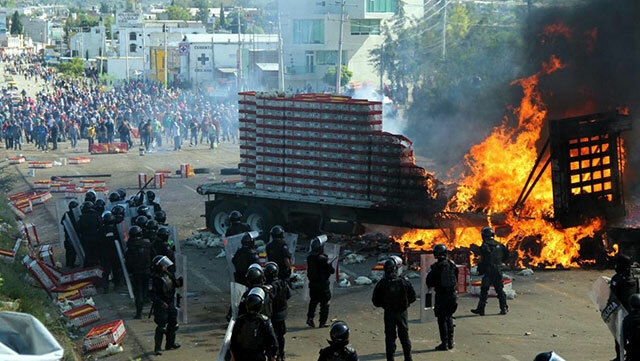 The murderous federal government of Enrique Peña Nieto (of the PRI), at the request of the state government of Gabino Cué, attacked barricades on the state’s highways from the air and on the ground. Teachers, parents and residents fought back with sticks and stones against the ferocious attack by the federal police on the night of June 17 in the oil port of Salina Cruz in the Isthmus of Tehuantepec, and then subsequently in the Mixteca region and in the Central Valleys. For the bourgeoisie, smashing the teachers’ struggle is fundamental to advancing the privatization of public education and the destruction of independent unions in the country. For the workers movement, stopping the blood bath is a question of elementary survival. Mobilizaitons denouncing this attack are urgently needed throughout the country, on the road to a genuine national strike. In recent years, the teacher’s struggle has become a matter of life or death. Long gone are the ritual teachers demonstrations in the game of give and take between the government and the union leadership, in which the pattern of “mobilization-negotiation-mobilization” gave the appearance of producing some results. From the time of the uprising of 2006 on, the teachers’ struggles have confronted a voracious bourgeoisie avid to turn education into a source of profit, and thus to eliminate the right of working people for their children to get a free, high quality public education. Today the PRI federal government of Peña Nieto wants to do to the CNTE what the PAN (the clerical-rightist National Action Party) president Felipe Calderón did to the SME (Mexican Electrical Workers Union) in order to impose the so-called “labor reform,” and later the energy “reform” in the midst of his deadly “war against drugs” which cost the lives of over 200,000 people. The struggle is not only national. The “structural reforms” which Mexican governments are attempting to implement have been dictated by world imperialism and designed by its financial agencies. The “education reform” that consists of penalizing teachers for all the ills of this decaying capitalist system is being carried out from Chile to Brazil and inside the United States. The bourgeoisie is trying to counteract its declining profit rate by having the entire weight of the world economic crisis fall on the shoulders of the working people and the urban and rural poor. However, in his eagerness to smash the teachers unions that are independent of the state control exercised by the SNTE, Peña Nieto’s government has made a big mistake. By declaring that any teacher who is absent for three days in a month would lose his or her job, it has created a force of tens of thousands of battle-tested fighters who literally have nothing to lose, and thus are prepared to go to the limit. 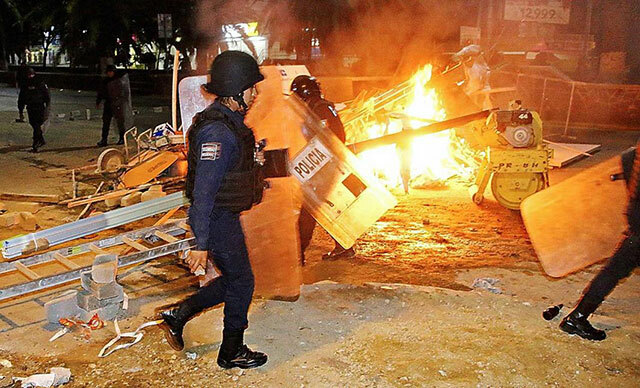 The level of state violence today is comparable to that imposed on 25 November 2006, at the end of the Oaxaca rebellion, with one major difference. Instead of drowning the uprising in rivers of blood, today they have led to its intensification. Even bourgeois sectors – leaders of the restaurant and hotel trade, the manager of the Guelaguetza folklore festival, large farmers, church hierarchs – have been frightened by the scope of the resistance, and notably by the massive participation by parents. They say that this is “worse than 2006,” and timidly suggest that a “conversation” with the teachers be undertaken in order to restore calm. But however much the leaders of the CNTE call for “dialogue,” as in the teachers mobilization of 2013, this is a trap: the murderers in power are deaf to the strikers’ demands. They will not give up at the bargaining table what has not been imposed on them by the force of the workers movement. What’s needed is to forge a leadership with the revolutionary program and determination to mobilize that force in an all-out battle. On June 12, after the arrest of the top leaders of Section 22 of the CNTE, police evicted the protest encampment in front of Oaxaca state education institute. The teachers resisted in a battle that lasted several hours into the early morning. Retreating under police fire to the Zócalo (main square), they set up flaming barricades in self-defense. The Grupo Internacionalista has actively intervened in the teachers strike from the start, participating in marches and blockades. We have sold more than 1,000 copies of Revolución Permanente in Oaxaca alone. We have organized Marxist study groups outside the headquarters of the CNTE’s Section 22 in Oaxaca and in the moving encampment in Mexico City. We have shown political films in the same places. We have spoken on Radio Plantón, the teachers’ radio station, in our program, the “Internationalist Workers Frequency.” We have distributed thousands of leaflets warning against voting for any bourgeois party, including AMLO’s Morena. In all this, we have called since the beginning to extend the strike to the entire education sector nationwide, and to mobilize key sectors of the industrial proletariat in a powerful national strike. Only in this way can we stand up to the state that not only is attacking the teachers but the entire workers movement. Thus our comrades organized brigades of striking teachers to agitate among students, workers and faculty of the National University of Mexico (UNAM). We were able to get the Philosophy and Literature School of the UNAM to strike on May 17, helping out with CNTE teachers, mainly from Oaxaca, in speaking with striking students about the need to extend the strike to the entire education sector, which is today under attack. Also in meetings of the STUNAM union, members of the Grupo Internacionalista and CNTE teachers called on the workers to go on strike. In doing so, we were able to observe the games played by the bureaucracy of STUNAM leader Agustín Rodríguez who publicly talks of his solidarity with the teachers strike but inside the union argues that going on strike together with the teachers is impossible. It is clear that the will to struggle and combativeness of the teachers not only has not diminished but has grown with every attempt by the government to stop the mobilization. However, the political strategy of the CNTE leadership has beeen to press for dialogue with the bourgeoisie, going to Gobernación (the interior ministry) and Los Pinos (Mexico’s White House) to beg for someone in authority to grant them an interview. At the same time, it is seeking an alliance with the parliamentary deputies of the bourgeois parties and to divert the struggle onto the sterile path of bourgeois electoral politics, calling to vote for Morena. To believe in the empty rhetoric of supposed support for the teachers from AMLO, whose job for the big capitalists and their imperialist godfathers is to channel struggles into pressuring the institutions, is a guarantee of defeat. We already warned in our supplement calling not to vote for Morena or any other bourgeois party. What’s needed rather than the popular-front policy of class collaboration is intransigent class struggle. It’s necessary to fight with complete political independence from all the bourgeois parties and politicians, including the PRI, PAN, PRD, MC (Citizens Movement), PT (Labor Party, a satellite of the PRD), Morena, AMLO, etc. The illusions in the pathetic mask of bourgeois democracy donned by the present semi-bonapartist regime of Mexican capitalism must be shattered. For its part, the ruling class has made it utterly clear that anyone who fights against the plans of capital will experience the sadistic response of the state. The long list of massacres, from 1968 and 1971 to the fateful night of Iguala of 2014, when the 43 teachers college students of Ayotzinapa were disappeared, and now that of Nochixtlán, register the fact that the Mexican capitalist state is fed by a tribute of human blood. No political reform or constituent assembly within the framework of capitalism can stop the capitalist onslaught which is destroying past gains and democratic concessions worldwide. The 2006 struggle in Oaxaca marked one of the cruelest class battles in a country convulsed by miners and metal workers strikes and large-scale peasant struggles. We are experiencing today a resurgence of the teachers insurgency that was begun 37 years ago against the phony trade-unionism of the corporatist SNTE (National Union of Education Workers). 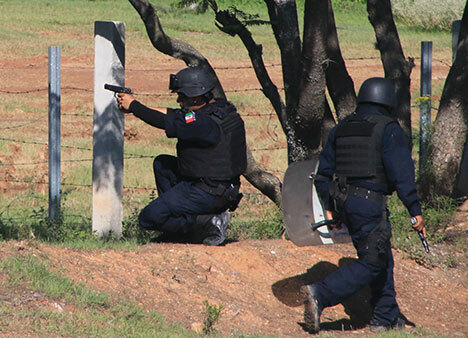 Today the SNTE is the spearhead of the government attack on the CNTE. Following in the wake of the Federal Police, it promises to “clean out” Section 22 and impose its Section 59 of scabs and hired assassins. Nevertheless, illusions persist in some sectors of the CNTE of an impossible “democratization” of this state apparatus dedicated to preventing genuine independent workers unions. The strikebreaking by the SNTE in the current conflict should make clear the need to break the straitjacket of labor corporatism. It is also necessary to draw the lessons of the experience of 2006, which has entered the pantheon of heroic defeated struggles of Mexican history, such as Zapata’s at the time of the Mexican Revolution, which weigh so heavily on the consciousness of those fighting against this deadly system that they seem destined to repeat them, always with the same result. When on 14 January 2006 the state police attempted to evict the encampment of Section 22 of the CNTE in the Zócalo (main square) of the city of Oaxaca, the residents of the state capital came out in support of the teachers and defeated the cops. As the conflict escalated, there was talk of a “Oaxaca Commune” and even dreaming about a communist society in that one state. However, for all the popular combativeness, which was able to push the police and the state apparatus out of the city of Oaxaca for over five months, the Oaxaca State Trade-Union Front and the Popular Assembly of the Peoples of Oaxaca (APPO) which led the struggle followed a popular-front policy. With their narrow reformist outlook, they were unable to extend the teachers strike not only beyond the borders of Oaxaca, but even to other areas inside the state. By focusing all the will to struggle shown on hundreds of barricades into bourgeois parliamentarism, the leadership of the teachers and the APPO called for a “punishment vote” against the PRI and PAN, thus channeling the struggle into supporting the then candidate of the PRD, López Obrador. Thus instead of fighting to break with the bourgeoisie, they pave the way to defeat. Following the elections, fraudulent as always, and with the movement politically disarmed, lacking a policy of class struggle, came the dark night of November 25 when the Federal Preventive Police swept through the historic center of Oaxaca city and arrested hundreds of activists, putting a full stop to the audacious teachers struggle, at a cost of 26 compañeros murdered. Now the situation is more acute. Following the implementation of the education reform, which the CNTE mobilization in 2013 was not able to beat down, the bourgeoisie figured that by taking away from Section 22 the control of some parts of the state education institute it could undercut the teachers’ capacity to fight. Another mistake. Even without the incentive of earning points by participating in protests, and defying the threats to fire them without severance pay, thousands of education workers are once again joining encampments, blockades and barricades. The teachers’ example can also by a catalyst for social discontent produced by the firing of 30% or more of public sector workers, the process of de facto privatization of the health sector, of the massive firing of Pemex (state oil company) workers and an exchange rate that has fallen to 20 pesos to the dollar, drastically cutting into the purchasing power of working people. In 2016, in contrast to ten years ago, the teachers struggle is not limited to the Oaxaca capital and the Valles Centrales region but has extended to the Tehuantepec Isthmus and the Mixteca region. The former includes strategic facilities for the bourgeoisie, like the refinery at Salina Cruz, which supplies fuel to practically all the Pacific Coast states. The blockade of the refinery checkmated the government, and also won sympathy for the teachers’ struggle from some oil workers who saw how “their” union (the corporatist STPRM) hasn’t put up the least opposition to the energy “reform” which is threatening to cost them their jobs. Also in the Isthmus, health workers have given decisive support to the teachers’ struggle. In the Mixteca, the educators’ strike has been joined by activists from all over the region, as was seen in the memorial service today in the city of Tlaxiaco for two of those who were cut down in the massacre at Nochixtlán. In 2016, in contrast to 2006, the onslaught against the teachers takes place in a fertile field for extending the strike to other key sectors of working people In the last year there have been the explosive struggles of the agricultural workers of San Quintín and the maquiladora (free trade zone) workers in Ciudad Juárez. Today the health workers, who have shown their support by attending the wounded on the barricades and calling strikes in solidarity with the teachers, are fighting against a phony “universalization” of health insurance will mean slashing the right of workers to medical services. The steel workers of section 271 of the semn-corporatist Union of Mine and Metal Workers in the port of Lázaro Cárdenas, Michoacán have been subject to harassment by the government, which after a strike in the steel plant in March of this year arrested five leaders for protests in 2007. 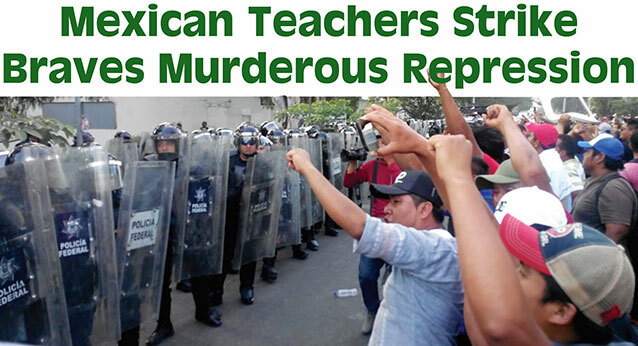 In 2016, as in 2006 and 2013, the combative teacher unionists organized in the CNTE have played a leading role in heroically confronting the state, defending public education and nearly 40 years of independent trade unionism against labor corporatism. But to avoid repeating the story of those defeats, it is necessary to draw the lessons and apply them to the current struggle. The movement of 2006 was defeated because it didn’t go beyond the limits of the state of Oaxaca to become a national strike, nor did it extend to the industrial proletariat even though at the time there were workers strikes in various parts of the country. In 2013, the CNTE left the teachers of Guerrero hanging when they went out on strike against the education “reform,” only undertaking national action some months later. And it ended up accepting the false promises of a “dialogue” with the federal and state governments which are now brutally attacking them. “In order to win this battle, a proletarian leadership is required which breaks with all the bourgeois parties on a genuine class program and mobilizes the tremendous power of the working class nationally against the capitalist state…. “The ‘democratic’ program has led to a dead-end, because the struggles of the working people cannot be resolved on the basis of bourgeois democracy – which, moreover, is impossible in semi-colonial countries like Mexico. As Trotsky indicated in his perspective (both a theory and a program) of permanent revolution, today no wing of the capitalist class is capable of carrying out the tasks which the great bourgeois revolutions accomplished in centuries past. The agrarian revolution necessary to free poor peasants and Indians from their centuries-old poverty; national liberation from the imperialist yoke; and democracy for the exploited and oppressed, the wage slaves of capital, can only be won through workers revolution, expropriating the profit-hungry bourgeoisie and extending to the very heart of the empire, where today more than ten million Mexican workers toil…. We do not look backwards, to the heritage of Zapata’s peasant nationalism; instead, we seek to be the proletarian Bolsheviks of the 21st century.